When inventor Oliver Evans first conceived of his “refrigeration machine” in 1805, he never dreamed it could be a killer. He, much like Jacob Perkins and John Gorrie (both of whom would soon improve upon the design), dreamed simply of extending the preservation properties of food. None of them imagined their invention had deadly potential, providing a perfect-sized trap for a curious child who might dare step inside its door. I first heard of refrigerator deaths while serving as a summer camp counselor in South Milford, Indiana. The victim was Bobby Watson (a camper who never existed), who, in the summer of 1968—while lost in the throes of a game of hide-n-seek—wedged himself into an abandoned fridge left to rust on the edge of the dock. A maintenance man wandered past moments later, tied the fridge to the dock, and, as fate had it, heaved it into the water, wholly unaware of the child hidden within. The fridge, we informed our campers during weekly retellings, was meant to serve as an anchor for the docks, though for Bobby, it served as a coffin, instead. We recounted how the water trickled in through that refrigerator door, flowing up past Bobby’s ankles, his knees, his waist, cheeks, and finally, even his mouth. It was all a bunch of bull. Inside, he tried to tread water, we lied further, taking one final inhale before the water reached his terrified eyes. At this part of the story, we were often greeted by several sets of equally terrified eyes, a cabin full of mouth-gaping nine-year-olds who could not believe what they’d heard. I dedicated several summers to this place and can verify the story. That is, I can verify that it is a story, one employed by counselors as a cautionary tale to scare campers into steering clear of the waterfront after dark. Yet no matter how well we told it (and most of us told it well), the campers always seemed far less afraid of drowning than the other half of the horror: being trapped inside that fridge. If a boy named Bobby Watson had actually died by refrigerator he would hardly have been the first. From the 1930s through the 1960s, America’s refrigerator deaths occurred with surprising regularity. While there’s no verifiable truth to the Bobby tale (no newspaper reports, no camp records), the story was likely inspired by the many deaths occurring in a similar fashion. By the 1950s, the death-by-refrigerator epidemic became a public health concern—albeit a strange one—and, in response to the crisis, in August of 1956, Congress passed the federal Refrigerator Safety Act. The legislation mandated that refrigerators be designed to open from the inside, as well as making it illegal for shippers to transport any unit that failed to meet this standard. The act—while an important first step—did not immediately solve the problem. There were still far too many unsafe refrigerators in operation, and the government could do little to force citizens to replace their perfectly functional fridges. In the years to come, as compressors and fans overheated, thousands of refrigerators were disposed of, though not always responsibly. 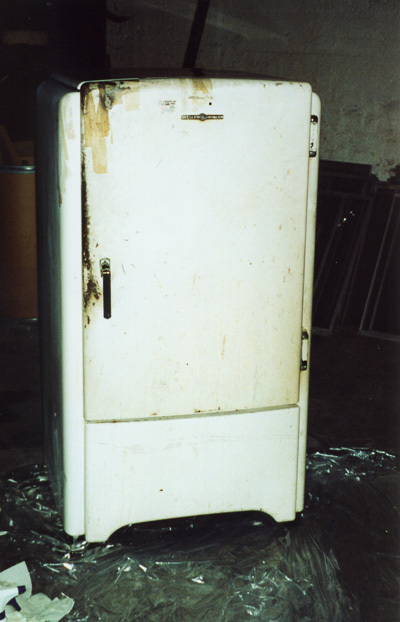 “[A]t least 163 [refrigerator] deaths were reported nationwide between 1956 and 1964,” reported writer Cecil Adams, adding that the number climbed higher in the mid-1960s, before eventually leveling off as the newer, safer models became popular. Nevertheless, the tragedies continued, prompting the press (and camp counselors) to maintain pressure on the manufacturers by immortalizing this strange fraternity of children whose curious nature ultimately cost them their lives. Children like three-year-old Larry Murphy and his four-year-old cousin, Paul, who in June of 1954 were discovered by a junkman as he prepared to break up an abandoned refrigerator in New London, Connecticut. They say Bobby’s mouth was full of fishes . . .
Or children like four-year-old Cynthia Ann Hartman and older brothers Joseph (five) and Martin (six), all of whom managed to squeeze themselves into an empty fridge in Chicago in August of ’64. No one knows how long Bobby lasted until the air ran out . . .
Three years later, in July of ’67, victim Roger L. Brown—who, according to the newspaper, had previously “been warned by his parents about playing in or around the abandoned refrigerator behind their house”—failed to heed that warning and was found suffocated inside a fridge in Sarasota, Florida. The image of children peacefully curled to sleep inside refrigerators seemed a stark contrast to the death Bobby Watson endured. His experience—fictional as it was—was nothing short of a fingernail-clawing horror story; an account that likely shared many details with the real-life victims. However, more shocking than either the vividness of the insurance ad or the Watson story was the realization that these tragedies were easily preventable had the public followed proper disposal protocol. To ensure the mistake was never repeated, local media issued a call for action, one newspaper deeming refrigerators “child traps,” while another described them as a “menace.” Forget Evans’s, Perkins’s and Gorrie’s great strides in the advancements of food preservation; for the moment, refrigerators were little more than chambers of death for the innocent. A coffin-sized home for Bobby Watson . . . In 1985, UCLA epidemiologist Dr. Jeff Kraus released a study, entitled “Effectiveness of Measures to Prevent Unintentional Deaths of Infants and Children from Suffocation and Strangulation,” which provided an in-depth look at the 471 lethal cases reported in California between 1960–1981. When Kraus broke the number down further, it revealed plastic garment bags as the primary suffocative child killer (responsible for 109 deaths), while refrigerators came in second with 84. As a result of both federal and state legislative efforts, Kraus reported a sharp decline in suffocation-strangulation deaths, though many were left to wonder how such a seemingly innocuous kitchen appliance—one used several times a day—had become such a safety hazard. Some might argue that our discomfort with refrigerator deaths centered not on the deaths themselves but on the complexity of our new relationship with such a beloved machine. Though in the early twentieth century, refrigerators quickly became America’s most necessary appliance—our protector of sustenance—they suddenly revealed their ability to take life away as well. It must have felt like a betrayal; after years of feeding from it, it appeared to be capable of feeding from us. What could possibly be more terrifying than that? People fear any number of things, only some of which make logical sense. Nevertheless, we have a name for all of them. If you fear belly buttons, then you suffer from omphalophobia. If you fear kitchen appliances (including the fridge), then you are an oikophobic. We have even given a name to those who fear nothing but the possibility of procuring a fear: you are a phobophobic. According to psychologist Nandor Fodor, claustrophobia—a fear from which Bobby Watson apparently did not suffer until his fatal moments—is defined as the “widespread morbid dread of confined spaces, small rooms, caves, tunnels, elevators, or pressing crowds.” Dr. Robert Campbell later revised the definition to include additional claustrophobic-inducing locales (“theaters, classrooms, boats, or narrow streets”). Neither definition makes mention of refrigerators. If you were to ask a sufferer of claustrophobia to name additional omissions, she might mention cellars, airplanes, cars, churches, roller coasters, or the daily fear of wearing a necktie. Imagine being buried alive in a hole. It’s like that. While the majority of mid-twentieth-century psychologists could easily diagnose the phobia, they struggled to gauge the degree to which one suffered from it. As a result, in 1979 psychologists developed the claustrophobia scale, a twenty-question assessment that helped narrow in on the acuteness of one’s fear. Participants were asked to rate their anxiety or avoidance on a number of uncomfortable scenarios, including “Entering a windowless lavatory and locking the door,” “Riding a small elevator by yourself,” and “Being outdoors in a fog when you can only see a few yards in front of you.” Once more, refrigerators were left from the scale. While few claim to remember this climactic moment of the post-birth near-death experience, Fodor argued that the psychological stress of the moment is forever encoded in the child’s subconscious, that “evidence of it can be found in morbid suffocation fears.” For Fodor, our fear of confined spaces (and the possibility of suffocating within them) is simply an unavoidable side effect of being born, one that points toward an inarguable truth: before we can breathe, we can’t. Bobby could only hold his breath for so long . . . If claustrophobia serves as a psychological reminder that our mothers’ wombs are one-way swinging doors, sufferers of claustrophilia might argue the opposite. While claustrophobia can be an acquired at birth or developed later in life, claustrophilia seems to be a biological imperative of birth. It’s as if, in the early stages of development, Fodor’s theory of birth-trauma-as-a-gateway-to-claustrophobia remained momentarily repressed, at least for newborns, who remain the world’s most exuberant practitioners of the claustrophilic life. An industry of baby-care books seems to confirm this, including Dr. Harvey Karp’s parental favorite, The Happiest Baby on the Block, which argues strongly in favor of the newborn’s need for the tight wrap of a swaddle as opposed to the freedom of unrestrained sleep. Karp’s theory has proved particularly true for my own four-month-old son, who a few weeks back was tucked tight in a swaddle and inserted into an MRI machine. Young Henry had been selected for a psychological study, and since a trusted friend was running the test, his mother and I signed off on the experiment. Despite our efforts, we couldn’t swaddle him tight enough to alleviate his fear. I couldn’t blame him. After all, if my own helpless body had been folded and inserted into a cylindrical tube, I, too, would have cried. But eventually the swaddle did its work and he returned to a womb-like state, snoring blissfully as the machine’s bleats failed to wake him. His mother and I witnessed no trauma, just contentment; though as he slept, I began feeling claustrophobic for all of us. I took a seat in a nearby rocking chair and watched the red glowing number indicating heartbeats per minute. I rocked to his heartbeat, the quick back and forth of the chair a small comfort as I prayed for him to stay asleep. Bobby was awake for all of it, scratching at the inside of the fridge as the water poured in through the cracks . . . I wondered what might be the long-lasting ramifications of this experiment, if he might be scarred if awoken while trapped inside the tube. He did wake, eventually—wailing as he struggled to break free from the straightjacket in which we’d entrapped him. Upon hearing his cries, our scientist friend immediately shut the experiment down, pressing the red button that eased the magnets back into place and killed the buzzing and whirring that had engulfed us all just moments prior. The damage was done, though hopefully nothing was permanent. Not as it had been for the fictional Bobby Watson or—far worse—for real-life Larry and his cousin, Paul, for Cynthia and her brothers Joseph and Martin. It was not as it had been for young Roger, whose parents had warned him, though likely not the way we warned our own son. Please Henry, don’t ever leave the safety of the shore . . . We left the lab and did not return there. We no longer swaddle him; he doesn’t let us. B.J. Hollars is the author of several books, most recently. From the Mouths of Dogs: What Our Pets Teach Us About Life, Death, and Being Human, as well as a collection of essays, This Is Only A Test, forthcoming in 2016. Hollars serves as a mentor for Creative Nonfiction, and he is the editor of the Pleiades Book Review.